Apologies for the prolonged quiet from this end of the the interwebs. Life just seemed to amp it up for a little while there! So what happened while I was gone? My Mum had her birthday. A week later I had my first Mother’s Day. A week later Lego Man had his birthday. Add into the mix a very fun and cute 2nd birthday party at a miniature working train park, work, mothers group, 4 new molar’s, cold weather and you can see why I BOUGHT MYSELF A SLOW COOKER!!! I so feel like a Mum now. Hopefully this Flavour Maker will help us churn through the kilos of meat I bought on impulse (who can resist half a kilo of organic scotch fillet for $3??? thankyou quick sale at Woolworths!). That amazing day that I got distracted by the cheap meat (and yes I am literally referring to meat and not any male performers), I managed to get so excited I drove home to realise I had forgotten milk and nappies. So far we have made Devilled Beef (sounds so old school, meat tasted as old as it sounds), Moroccan Beef (I think some of the flavour got left behind in Morocco) and then tonight Cinnamon and Lemon Lamb Shanks (must find a cheaper place to get lamb shanks… $26 for 4 is a bit rich). Tomorrow night is a Vietnamese Chicken Curry ($2.06 for 8 free range drumsticks! booya!). My aim in the next week or two is to get back into the groove of sharing our meal plans and recipes with you. Got a good slow cooker recipe? I would love you to share! We are well and truly into Autumn now. The leaves are all turning their gorgeous colours, and falling in their relaxed way to the ground. Mushrooms are popping up everywhere. The days are getting a little shorter. The nights are getting a little cooler. But the basil is still bountiful at my local fruit and veg. $3 for a bouquet of fragrant greenness. A little reminder of the summer just passed. Calling out to be made into garlicky pesto. I have a memory as a child of refusing to eat my mum’s home made basil pesto. Oh the ignorance! My mum is a wonderful cook, everything she makes is delicious (she would refuse to accept that statement). I am so grateful my palate has changed since being a kid. Otherwise I’d still be eating fish fingers, cauliflower and corn on the cob. After last night’s “night off” the meal plan needed to change a little so as not to waste food in the fridge. We were meant to be having Chicken Pesto Pasta. But instead of chicken (it’s still in the freezer) we had flathead fillets. I also roasted up some butternut pumpkin to stir through the pasta as well. A delicious combination as it turns out! A bit of steamed broccoli on the side and a lovely meal is made. Pesto is very simple to make and if you can find a big bunch of basil pretty cheap, then it works out to be economical too. It’s able to be frozen and used at a later date, though it may discolour (it won’t affect flavour though). A far healthier option compared to store bought, particularly in reference to salt content. My version tonight had no salt added and was delicious. You can either use a mortar and pestle or a food processor. Put the basil, pinenuts, parmesan and garlic in the food processor. Blitz to desired texture. Keep it running as you pour in the olive oil. Ta Dah! I had to wait for Legoman to get home before being able to turn the food processor on (poor petrified Possum). Thankfully it only takes a moment to make. The flathead fillets were on special at our local supermarket (Australian fish, I don’t buy imported fish). Super easy and quick to cook. Get a plastic bag you use for produce at the supermarket. Add a couple of tablespoons of flour with some salt and pepper. Shake the fillets in the bag with the seasoned flour until coated. Heat some ghee in a non stick pan and cook the fillets for a couple of minutes each side. Done! Lovely sweet fish. And to save time and effort with the pumpkin, leave the skin on, you can eat it! Slice into 1cm thick slices, add a blob of oil then roast for 45 minutes in a 180 C oven. Cut the slices into… slices, then add to the pasta and pesto. Time Factor : EXCELLENT. Yes the pumpkin takes a while to roast but that is something you can chuck in the oven and get on with other things. 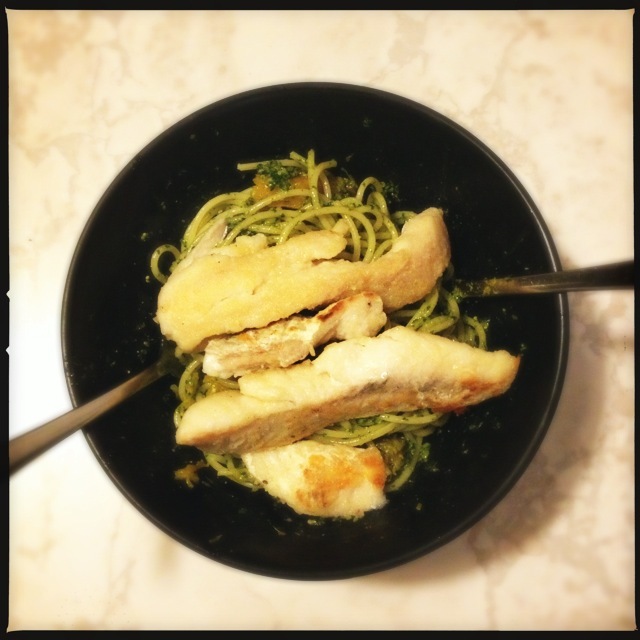 You could make the pesto and the fish in the time it takes the pasta to cook. We cooked the broccoli in the microwave which takes 1 minute. Complexity : LOW. No tricky steps or fancy ingredients. Just simple cooking using real fresh ingredients. Mess : MODERATE. The downside of using a food processor is having to clean it. So many bits and pieces. Some nights, using a few extra pots but having a quick dinner trumps a one pot wonder that takes 2 hours. Tummy Filling Factor : EXCELLENT. I did go back for seconds of the pasta and pesto. Can’t let good things go to waste! Possum Friendly? YES. Possum loves fish, plus the pesto is a great way to introduce herbs and strong flavours. I would choose an easy to handle pasta shape for bubs, like penne or bow ties. Would I make it again? Yes. Certainly will! 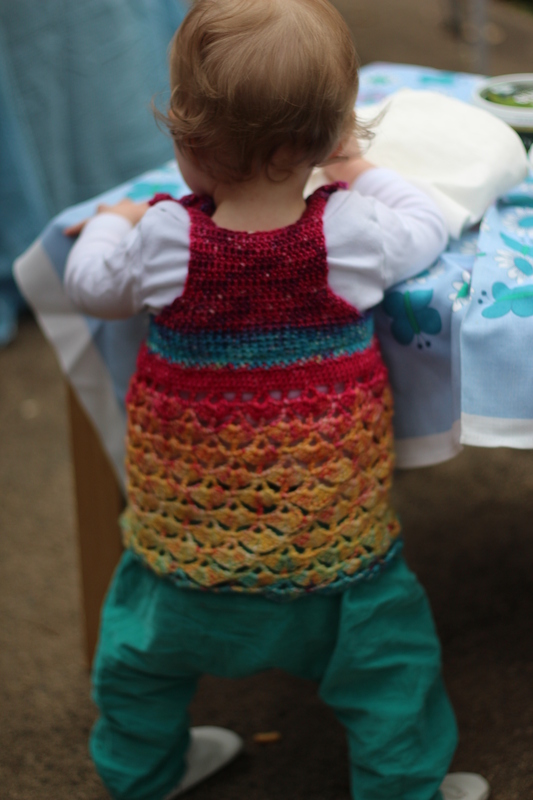 In other news, I have very nearly finished (just need to weave in the ends) the gorgeous rainbow dress I have been crocheting for Possum! I bought an amazing skein of yarn hand dyed by Nunnaba at my local yarn shop. 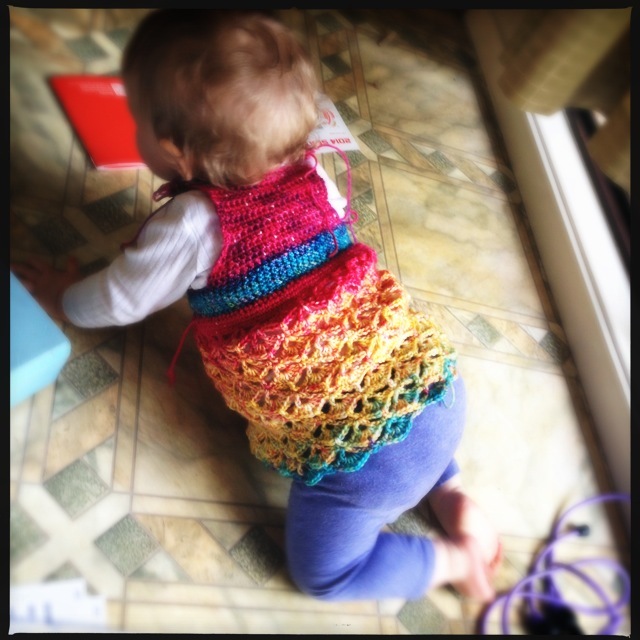 It has been such a wonderful experience working with her yarn. The way the colours change and blend together is simply gorgeous. Beats any commercially dyed yarn easily. So here is Possum crawling (!!) in her new rainbow dress.